I’ve always loved going to conferences. They allow me to step outside of my current headspace and listen to fresh perspectives. It opens up my mental lens to take in other questions than the ones I’m working on and consider other solutions. You get to meet new people! See new things! Talk about my work to these new and interesting faces, that tends to make me excited about getting back to the problem at hand. Although attending conferences does take some time away from day to day work, they are worth the energy gained from the interaction. And this year, I was offered the opportunity to attend the GOTO Berlin conference and to write down my thoughts on the experience overall. TL;DR: The talks were interesting, the people were fun to chat with and the swag was epic (I didn’t win the raffle for the lego Millenium Falcon, but you can bet I entered!). GOTO also talked a lot about a topic near and dear to my heart: diversity in tech. But that just scratches the surface of the overall conferencing experience. 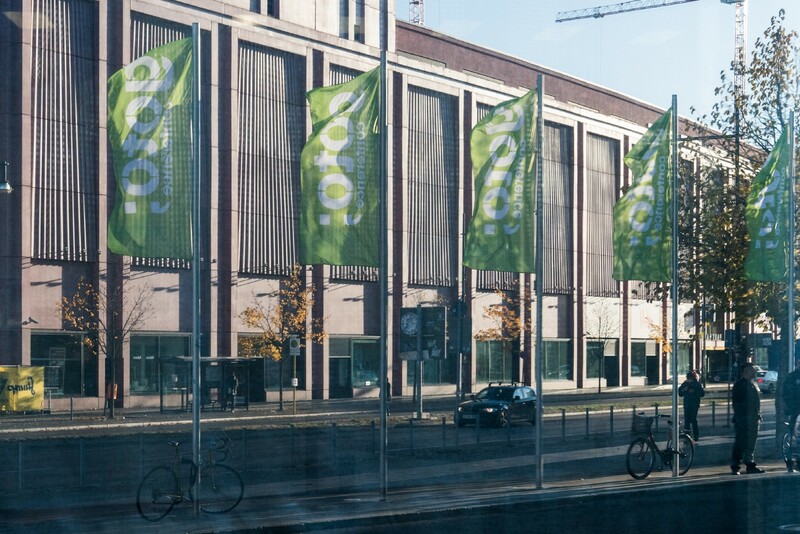 So without further ado, here are some thoughts on GOTO Berlin 2018! When I’m working through a problem I tend to become very focused. I think about the different angles and possibilities and I try to come up with a simple solution (the simpler the better). I also tend to become fairly myopic. My focus blinds me to other questions and other processes. And if I extend this to the amount of time it takes me to finish a microservice then by the end my mind is full of one group of problems, in lieu of considering any other. Which is why hearing talks is so instrumental to helping me grow as a data scientist. You learn about new subjects and techniques, you get insight into what ideas might be coming next and new perspectives on old topics. I know we’d like to think that our tech department is the best in the universe and there is no problem we can’t solve (I mean… I really do think that), but ultimately there is no point in reinventing the wheel. Has someone else tried this? What did they do right? What did they do wrong? What did they do different? Sometimes hearing how other people solved a problem will help you approach a similar problem. Newton only saw further by standing on the shoulders of giants. And I learned a lot at GOTO Berlin (it’s kind of the same thing). The conference is very innovative so there were lots of interesting new things to hear about. Personal favorite talks? Krzysztof Kudrynski and Blazej Kubiak, engineers from TomTom, built a machine learning algorithm for a drone to fly itself, and the CTO of OLX Group talked about setting up a data driven culture. Also, I would be remiss if I didn’t mention the awesome talk by our own CTO, Pat Kua on Talking to Tech Leads. Who you talk to: will you be my friend? People tell me that one reason to go to conferences is to network. However, I’m phenomenally bad at networking. I tend to be awkward, but excited to meet people. Like a social butterfly with a broken wing. So when I attend conferences I usually stick to the people I came with. For the record, this is not what I’m supposed to do. But at GOTO I went solo, so I had to find people to talk to. Strategy: walk up to a group of strangers and ask: “Hey! What are we talking about?”. Success rate: surprisingly high. Turns out, everyone else at the conference is also there to meet people, and talk about their work. So I chatted with developers, data scientists, an agile coach or two. I got to learn about how data teams are structured at different companies, and different ways to be agile. And I got to meet other like-minded people and talk about our respective journeys in tech. It was really fun and interesting! Additionally, big part of conferences is recruiting. Especially at a conference like GOTO Berlin, which bills itself as a conference for developers by developers. Since we are actively hiring people in tech (cough, developers, cough cough), this is where we want to be. As such we had a booth at GOTO which was manned by one recruiter and one developer at all times. Plenty of opportunity for people to come over and talk to us about N26 and what we’re all about. Moreover, we got a chance to talk to some of our customers! We got feedback on our product which helps us learn how to get better. Both the booth and meeting people help us as a company engage with the Berlin tech community. And that’s pretty awesome. As a woman in STEM I sometimes get a bit evangelical talking about and promoting diversity subjects (ie: “Have you heard the good word about diversity?”). Luckily, so did most of the other people at the conference. There was an excellent talk by Lynn Langit and Jessica Ellis about teaching and encouraging young women to code. 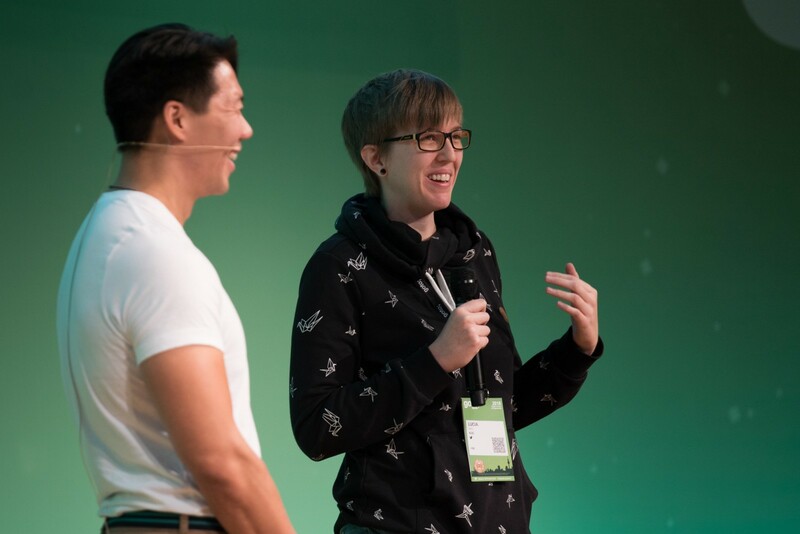 There was a panel about career paths that included two women (Sara-Lena Eisermann from New Work and Fusun Wehrmann from OLX) talking about their career trajectory and the issues they faced along the way. 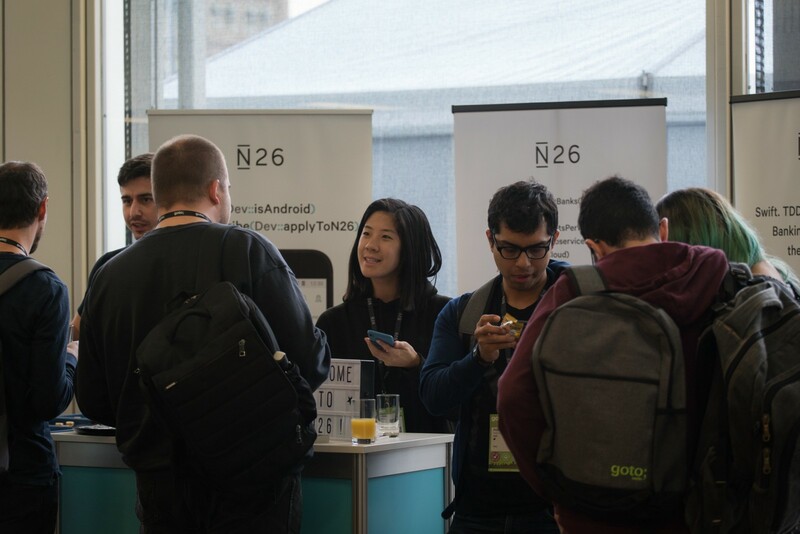 Additionally, our very own Lucia Payo, android team lead at N26 (pictured below), was given the cool opportunity to talk about her experiences becoming a tech lead. It was awesome to see diversity as an initiative! However, I can’t take talk to the bank. The conference attendees were overwhelmingly men. By a factor of 10–1. Which means either: 1) the industry in Berlin is overwhelmingly men or 2) a lot of women didn’t attend GOTO Berlin. My guess: it’s a little bit of column 1 and a little bit of column 2. Sadly, the above discussion is more lengthy than I have time for in this post, but might be the subject of a future blog post. But, what I can say is that N26 has been working hard to walk the walk. Company wide 35% of our workforce is women, and we are actively working to make hiring practices as diversity friendly as possible. Moreover we work to make N26 a LGBTQIA friendly environment, and had a pretty awesome float in the Christopher Street Day Parade. We’re not perfect, but we’re aware of the problems faced in creating a diverse workforce and are doing something to fix it. Talk is fine, let’s see some action! is a data scientist at N26. Her focus is machine learning and artificial intelligence, helping N26 on its journey to becoming the smart bank customers love.